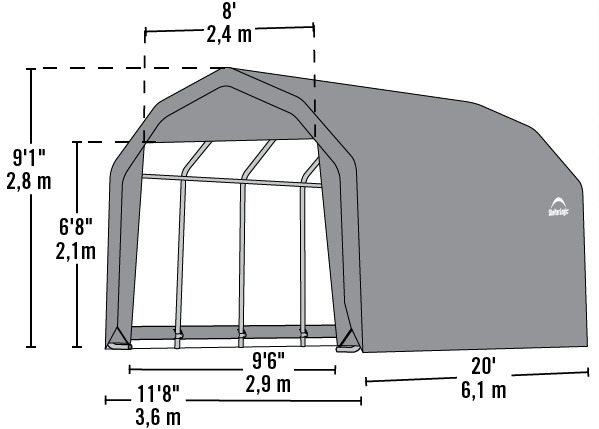 For reliable vehicle protection--or convenient storage without having to build a permanent structure--there's no better choice than Shelter Logic's Portable Garage Canopy. 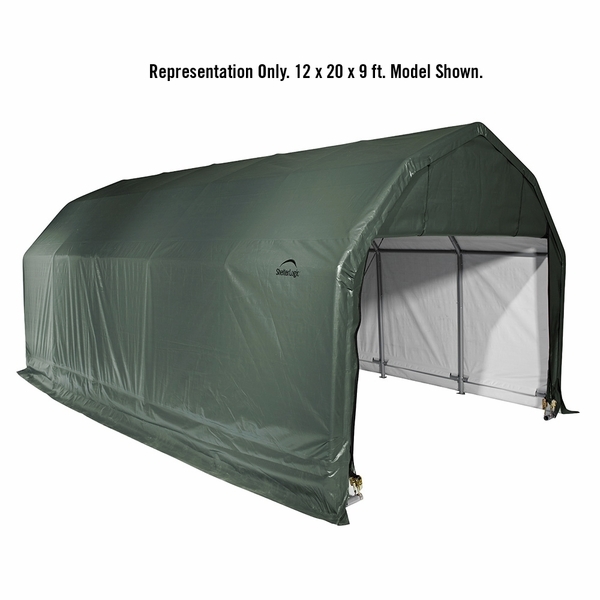 This multi-function shelter features a six-rib, 2" diameter steel frame, tempered with a 13-step Rhino Shield process and bonded with DuPont thermoset powder-coat finish. The garage cover is made from a single piece of 9 oz., heat bonded, triple-layered polyethylene treated with anti-aging, anti-fungal, and fade-bloacking agents. It's waterproof, tear resistant, and uses Twist-tite technology for a wrinkle-free look. This rugged 12' x 20' x 9' green canopy is simply peerless. What is the wind rating for this? It does not have a wind rating. If strong winds or severe weather is forecast in your area, the manufacturer recommends that you remove the cover. Just bought this item recently and was delivered free and came very quickly! Putting it together was very easy and quick. It looks great and is built very well!! We will see how it holds up to New England winter. Its been thru two small snow storms already and is working great. Very happy with this product and this store. I would recommend this to anyone looking for a great car garage or storage building. ConsNot the greatest instructions but online u can.find some better ones that will help u. We have had two other garages from other company's but this one was very easy to construct and came with some great features that the others did not have. We like the larger tube construction and the barn styling. With the green color the snow this winter should not be a problem like it was in the past with the other products. We love it! Overall this is a great product. I bought this to hold me over until a permanent Shed can be constructed. I have a tractor, golf cart and several other items in the shelter so it has plenty of space and keeps the weather out. The directions are ok but not great. They say it takes two people to put it together but I did it myself, I did need the wife at one point for five minutes but you can do it yourself if you need to. Be prepared to spend some time on this however, it took me a total of 12 hours (over two days) to get it done completely. Iâ€™m sure you could cut this in half with another person. They have a pretty slick way of getting the cover on which I thought would be the hardest part but in fact was one of the easiest tasks. Iâ€™ve had the shelter for about a month now and it has seen some weather, strong winds and heavy rain, so far so good. It is protected by woods on three sides so Iâ€™m sure thatâ€™s helping. Only time will tell how well it holds up. If I could get 5 years out of it I would be totally satisfied.